In keeping with Walter Devereux's vision for Hotel Colorado, each of our guest rooms have been designed with the flavor of 19th century Italy. From the imported Italian wallpaper to the individually selected artwork, the essence of history and classic style transport you to an era gone by. Hotel Colorado is under new ownership. All guest rooms have been updated with a/c units, and from February thru April 2019, they will be remodeling their ballrooms for your future enjoyment. Great accommodations for traveling family or friends. Enjoy two private bedrooms with one king bed, one queen bed and two bathrooms. Enjoy the amazing courtyard and mountain views. There is a private living room with wet bar including a refrigerator, microwave, and coffee maker. This suite is also equipped with an air conditioning unit. For something extra special, enjoy elegant suite accommodations with period reproduction antiques. There is a living room with wet bar including a refrigerator, microwave, and coffee maker. Enjoy a private bedroom with one king bed and bath. This suite is on the penthouse level for a more secluded and private experience. This suite is also equipped with an air conditioning unit. This suite offers accommodations featuring a large living room and private balcony with mountain views. Enjoy the luxury of a private bedroom with one king bed and bath. The room also offers a wet bar with refrigerator, microwave, and coffee maker. This suite is also equipped with an air conditioning unit. If you desire complete privacy with breathtaking views and all the comforts of home, this is the suite for you. Enjoy your own living room, dining room, and private bedroom with one queen bed and bath. There is a wet bar with a refrigerator, microwave, and coffee maker. 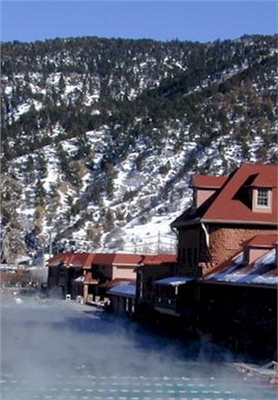 Enjoy two balconies with panoramic views of Glenwood Springs. This suite is also equipped with an air conditioning unit. These unique multi-bedded rooms provide the perfect solution for the family wishing to spread out. Three queen beds split between two separate rooms that connect to each other via a private bathroom, providing closeness while maintaining privacy. Our Classic Standard -King or Queen guest rooms offer our guests comfort in a King or Queen bed. Each room provides a spacious closet and is distinctive in its layout and design.While capturing the spirit of yesterday, our guest rooms provide the traveler all of today's amenities. 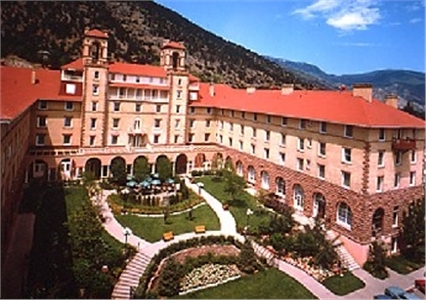 Please note: As a historic property, the Hotel Colorado does not have Air Conditioning. Our Classic Standard - Double Queens. Each room provides a spacious closet and is distinctive in its layout and design.While capturing the spirit of yesterday, our guest rooms provide the traveler all of today's amenities. In honor of the visionary builder of the hotel, the Devereux Suite boasts three bedrooms, each with their own private bathroom. One room has two queen beds, and the other two rooms have one king bed. There is a huge living room with wet bar, refrigerator, microwave, and coffee maker. 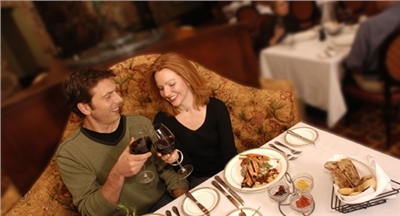 In addition, enjoy dining around an antique table that seats eight in your own dining room. This suite is perfect for reunions, groups of friends, and large families. The charm and elegance is well worth the value. This suite is also equipped with an air conditioning unit. If you desire complete privacy with breathtaking views and all the comforts of home, this is the suite for you. Enjoy your own living room, dining room, and private bedroom with one queen bed and bath. There is a wet bar, refrigerator, microwave, and coffee maker. Relax in the whirlpool bathtub. 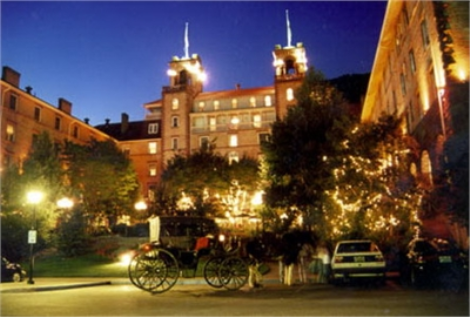 Enjoy two balconies with panoramic views of Glenwood Springs. In addition, the room is filled with family photographs and memorabilia of Molly Brown. This suite is also equipped with an air conditioning unit. Enjoy accommodations featuring a large living room with wet bar including a refrigerator, microwave, and coffee maker. You also have the luxury of your own private bedroom with two queen beds and bath. Enjoy accommodations featuring a large living room with wet bar including refrigerator, microwave, and coffee maker. You also have the luxury of your own private bedroom with one king bed and bath. These unique multi-bedded rooms provide the perfect solution for the family wishing to spread out. Four queen beds separated between two separate rooms that connect to each other via a private bathroom, providing closeness while maintaining privacy. 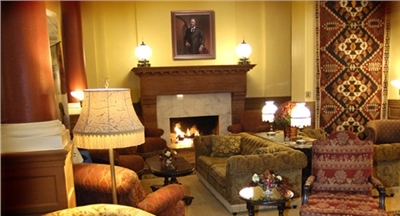 Find yourself sleeping in the same room that President Teddy Roosevelt did in 1905. You will enjoy a very spacious living room with wet bar including a refrigerator, microwave, and coffee maker. There is a private bedroom with one king bed and an over-sized bathroom. There is an extended balcony where President Roosevelt addressed the citizens of Glenwood Springs prior to his return to Washington. In addition, the room is filled with photographs of his life and the legacy he left behind. This suite is also equipped with an air conditioning unit. From east or west on I-70, exit 116. One block to 6th St. Right on 6th St. Two blocks to Pine. Cancellation	| 48 hours prior to arrival. Failure to adhere to cancellation policy may result in a charge of one nights room and tax. Other	| Cancellation - 48 hours prior to arrival. Failure to adhere to cancellation policy may result in a charge of one nights room and tax. Children	| Children under the age of 18 stay for free.